Hallowe’en treats are for people, not pets. Store candies where pets can’t reach them. Things to watch for are candy wrappers and lollipop sticks, chocolate, raisins, and sugar-free candies containing the sweetener xylitol. If you feel your pet may have eaten Hallowe’en candy or is exhibiting any signs of trouble such as lethargy, tremors, nervousness, vomiting, diarrhea, increase heart rate or in severe cases of chocolate toxicity, seizures, contact us immediately. Pet Hallowe’en costumes are adorable! Of course they are not without risks. If you are going to dress-up your pets you must make sure it does not interfere with their ability to breathe, see, move, hear or bark. Costumes should be well constructed and there should be no small or easily removable pieces that the pet may decide to eat. When purchasing, ask if your pet can try the outfit on, watch for any tight elastics that may cause swelling, make sure the costume is roomy, but not that it will fall off and the pet become entangled in it. Never leave your pet unsupervised while wearing a costume. 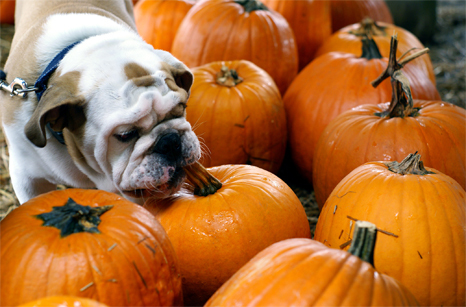 To prevent the risk of burns or potential fires, keep pets away from lit pumpkins. While children are coming house-to-house trick-or-treating you need to pay special attention to your pets. Pets may try to run out the door when opened for visitors. Make sure pets have accurate up-to-date identification in the form of a collar and tag, or microchip. Other pets may see the constant knocking as intruders coming to the house. These pets should be kept in a room away from all the action during peak trick-or-treat hours. There are some cases where pets are so stressed by trick-or-treaters you may need to blow out your pumpkins, turn off the lights and call it quits for the night. It is also important to move rabbits, pocket pets and birds to a separate room to prevent illness from the drafts of opening and closing the door. If you are taking your pet trick-or-treating make sure to have them on-leash. There are lots of cars out on Hallowe’en in Muskoka as families bring their children into town where the houses are closer together. It is also helpful to have an extra family member willing to take the dog home if they are no longer having fun on their walk. If you have a black cat we strongly recommend keeping them indoors a few days before and after Hallowe’en. Cats can still be the victims of horrible Hallowe’en pranks. Happy Hallowe’en from the staff of Bracebridge and Huntsville Animal Hospitals!